A new shipment of jigsaw mats and tatami mats is set to arrive at the end of the month. 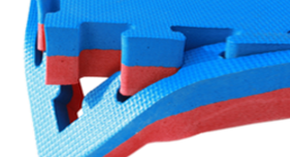 We have a container load of black and grey interlocking jigsaw mats and blue / red interlocking jigsaw mats. The tatami mats that are arriving will be back 1 x 2m mats and grey 1 x 2m mats.